I recently started using an Arduino in combination with a SheevaPlug as a convenient platform for hardware hacking. The two work together well, with complementary strengths. This describes my experience. The Arduino is a popular microcontroller platform consisting of a small, inexpensive board and an easy-to-use C-based development environment. The board has multiple digital I/O pins and analog inputs, and a USB serial port connection for programming and communication. The Arduino can be interfaced with a wide variety of hardware. (The Arduino is kind of like a Microchip PIC development board, but uses the ATmega328 AVR microcontroller.) The Arduino is about the size of a credit card (but thick). It has connectors on top which will receive a daughter board (inexplicably called a "shield"), or jumper wires. 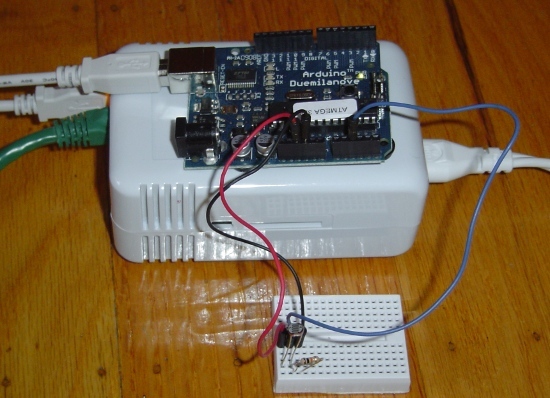 The Arduino is very easy to program and use. The Arduino is programmed using the Wiring language, which is an extension of C with many libraries to interface with various types of hardware. The Arduino IDE provides an editor and compiler for a "sketch" (which is the name for an Arduino program), and downloads the code to the Arduino board over USB. After seeing the Arduino hype at the Maker Faire, I got a Adafruit Arduino Starter Pack, and I've been happy with it. More information about the Arduino is at www.arduino.cc; the playground is a good place to start. You can do a lot with an Arduino, but it has some limitations. There's only 30KB of memory for programming (yes, kilobytes). Many things you might want to connect (Ethernet, SD card, USB hard drive or flash) require additional hardware, and even then are pretty limited. The Marvell SheevaPlug is a very small Linux server with a 1.2GHz 88F6281 ARM processor and 512MB of RAM and 512MB of flash storage. The SheevaPlug has a Gigabit Ethernet connection, a SD card slot, and a serial USB console connection. This all fits into a box the size of three cassette tapes that sells for $99 and uses about 5 watts of power. The SheevaPlug is designed to be plugged directly into the wall as a wall-wart, but the plug snaps out and can be replaced by a power coard. I'm currently using the "desktop" configuration with a power cord, since it's easier to connect things. Marvell recently gave me a SheevaPlug, and I've been enjoying it a lot. Because the SheevaPlug is a full Linux system, the standard Linux software packages are available and easily installed with apt-get (full list). You can run X-windows (of course you need to VPN in). You can run Apache and PHP on the SheevaPlug and use it as a web server. The GCC toolchain runs on it. You can program it in C++, Python, Scheme, or whatever. The main information source on the SheevaPlug is plugcomputer.org. Another useful site is computingplugs.com, a wiki about the SheevaPlug which is actually served by a SheevaPlug. The SheevaPlug and Arduino make a great pair together for hardware hacking projects since the SheevaPlug can easily provide the web server, computing, and storage functionality that the Arduino lacks, while the Arduino makes it easy to interface to hardware circuits. Moreover, the two are easily connected with a USB cable, and then they can communicate through simple serial communication (modulo kernel details below). The above picture shows the SheevaPlug and Arduino connected together by a USB cable. The SheevaPlug also has an Ethernet connection (green) and power (on the right). The Arduino has some jumpers to a breadboard circuit (described below). The screenshot below shows the web page that the SheevaPlug serves showing illumination across a few days. There are a lot of spikes due to turning lights on and off, but you can see where the sun rises, light increases through the day, peaking shortly before sunset. This web page illustrates the ability of the Arduino to measure analog data combined with the SheevaPlug's ability to collect data, plot it, and serve web pages. The pyserial library (apt-get install python-serial) provides simple access to the serial port. One thread reads lines from the serial port and dumps them to the data file along with a timestamp. Only one sample per minute is kept, and the others discarded. 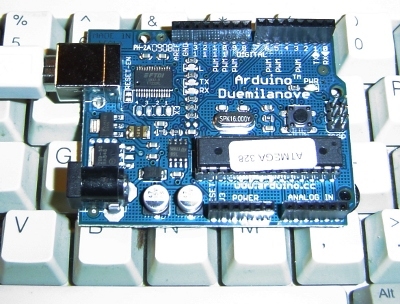 The Arduino may appear as a different device, e.g. /dev/ttyUSB0. If no such device appears when you plug the Arduino into the SheevaPlug, you probably need the kernel update below. The one stumbling block I encountered when using the SheevaPlug and Arduino together is the SheevaPlug kernel doesn't include FTDI support, which is necessary to access the Arduino via USB. An upgraded kernel is available, and much to my surprise it installed with no problems. So far, I've found the Arduino and SheevaPlug to work together well. I have various plans to use the Arduino + SheevaPlug for home monitoring and control, solar panel monitoring, IR remote control, and other random projects. If there's interest, maybe I'll write about them in the future. The ATmega328P actually has a built-in temperature sensor. It's documented in section 21.8 of the ATmega328P reference manual. I haven't tried to access this from within the Arduino sketch framework, but I suppose it's possible in some way. This is really cool. I've been wondering how those two would work together. This is excellent. Thanks! I'm trying to do the exact same thing except with XBee instead, but it also uses FTDI. This brings even more posibilities to make with the Arduino especialy proyects like home automation and monitoring. This is overkill imo, why go with a sheevaplug for 100$ when you can use an ethernet shield for 20$? 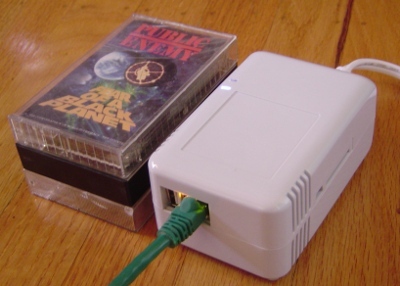 If you still like the idea of using embeded linux devices running webservers and all that, a much cheaper and more elegant solution can be achieved using a router (ex. FON) running openwrt and connecting the arduino to it via rs232. I am definitely interested! Please keep going, I may just to set up something like this myself (but I am quite a newbie). I have set up ethernet shield for what you have described in your blog, and have Arduino running the basic server codes, limitation of the server really hurts me though.. no php, no python, etc.... so I can definitely see a use for this set up, especially since it is "standalone" and you can do some analysis on the Sheevaplug? Sorry for double posting.. but is it possible to do you think this with the Pogo Plug as well? Usually Arduino is programmed with the Arduino IDE. As far as i can see, gcc-avr and avrdude are available packages for Sheeva with Debian installed. Did somebody find out what params especially for avrdude are needed ?? Would be nice to do all Arduino work simply from SheevaPlug commandline. I'm trying to do something similar. I've got a sheevaplug that I want to have monitor sensors and generate audio, and I've got an arduino that will monitor five motion sensors and spit the data out over USB. I tried to install http://sheeva.with-linux.com/sheeva/README-2.6.34.1 to NAND and now it will no longer boot after "uncompressing linux, booting kernel." I'd like to try again. Before I restore the OS, can you tell me what OS you used, and what kernel you popped on top of it? I found my issue. I forgot a setenv that was required to boot the new kernel. Things look good now! Thanks! I'm glad you figured out the OS installation, lance_! Could could you pass inquiry on to him if you know him ? I presently own two plug computers and am finally getting into it. my plug with debian squeeze installed on a 4 gb mmc card using ESIA. NOW THAT DID SOME DAMAGE, MAYBE IT WORKED ! APPARENTLY THIS ALSO INCLUDES vino which is the "VNC server for GNOME"
If this works then I will have both "vino" and "tightvncserver" installed..
And my disk space took another hit but survived. NEXT TIME I WILL USE AN 8 gb MMC CARD ! Ken, I hope this may all be of intererset or value to you. my laptop. Up until now I have been using a pUTTY terminal screen to talk to my plug via my laptop. I am hoping to see a Gnome desktop soon in it's stead. Hi Peruli - that's quite the effort, getting Gnome running on a plug computer. Unfortunately, I don't have any advice to give, as that's more ambitious than anything I tried. I have a sheeva PLUG and documentation with the package shows the process as a 88F6182. Maybe my doc is wrong or my PLUG is a different model, physically looks exactly the same.